Even though it plays a prominent part of the exterior logo, do not expect dolphin to be on the menu here. Thankfully it is omitted from the wide range of seafood on offer. Since everything is so fresh, there are limited portions of each, and do not be surprised if your first choice has sold out by 20:30 or 21:00 on a Tuesday. On any night of the week, there will be a wait, but the place has such an efficiency that they know their wait times and won't give you phony numbers. Leave your number on the list and have a drink nearby. It may seem boring, but the cold antipasto plate ($9.95, below) is an absolute must. 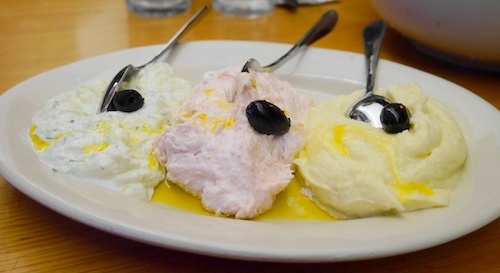 The tzatziki (far left) and taramosalata (middle) are absolutely excellent with the skordalia (right) coming in a distant third. The breads that are served with dinner are very good, and you can order pitas if you prefer. 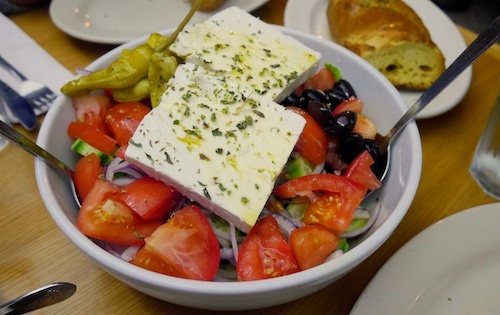 Also essential is a large Greek salad ($10.95, below). Large is no joke either, as the bowl below is bigger than your head and very good. 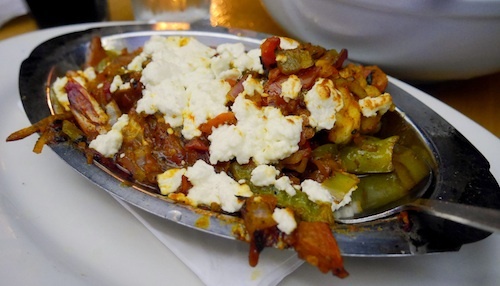 They are not stingy with the delicious feta, and all of the vegetables are so crisp and fresh. 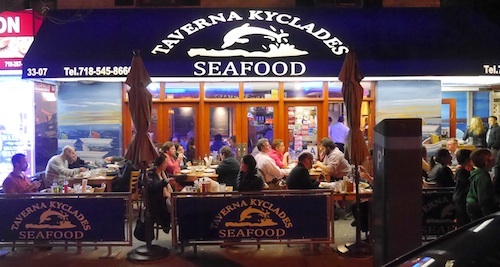 After the appetizers, it is good to remember that you come here for seafood, not land food. If you have a group of four or less and cannot order so many dishes, why not start with the Kyclades special ($33.95, below). 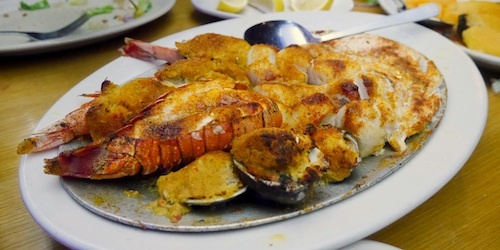 On the large plate, you get to try stuffed clams, stuffed shrimp, lobster tail, scallops, and a fillet of sole. The stand outs in our group were the stuffed shrimp, clams, and scallops, but lobster can never really be bad and was also scarfed down. 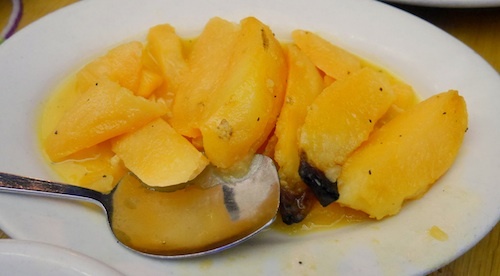 With most entrees, you are to choose an accompanying side dish, and one recommendation for that is the roasted lemon potatoes (below), which have an excellent texture and are surprisingly (or unsurprisingly?) full of intense lemon flavor. When the sardines ran out, we turned instead to the Greek style shrimp ($21.95, below), which cook the shellfish in a tomato and pepper sauce. The whole dish has ample feta drizzled over it, and the tastes are very complimentary. This dish was completely clean when it was removed from the table. 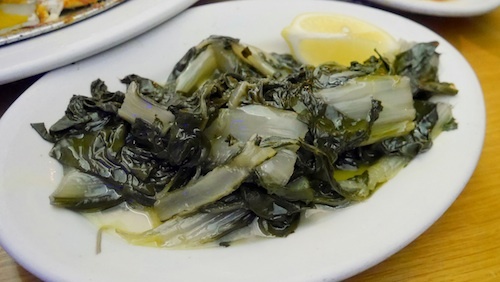 Our last side was the horta (below), steamed greens supposedly with olive oil and fresh lemon juice. Besides the slice of lemon on the plate, there really was nothing besides the limp, tasteless greens. No matter, we were focused on the rest of the meal anyways. The service does have a rushed quality to it, but these guys are running here and there and a bit understaffed for the amount of customers they have, especially when the restaurant is serving outside. It still feels welcoming, and the meals are enough to speak completely for themselves. Bring a date, some friends, and your whole family to enjoy as much as you can.